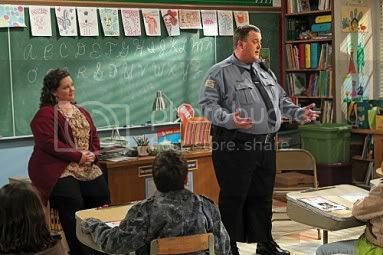 I had been thinking all week about writing about the new CBS show "Mike and Molly," and an article that Amy sent me totally solidified the plan. I should preface this by saying I'm not much of a TV watcher to begin with. I don't even have cable, so when I do watch shows, it's either online (and even then, I only really watch "30 Rock," and not even that lately) or at my parent's house (Jeopardy, every night, as a family). I just don't enjoy much of it, and I'd much rather see a movie, read a book, or do something creative. That said, I heard about "Mike and Molly," and I was intrigued. I had high hopes for it, but I was also suspicious. There is usually only one way that overweight people are portrayed in the media - constantly hungry, out of control, desperate, and a source of humor. I was hoping this would be different, that the characters would be dynamic and not stereotypical. It's a lot to hope for from a sitcom, but still, I don't think it's asking too much. While I watched the first two episodes, I felt really conflicted. Within the first minute, I knew it wasn't going to go well. I didn't love it, but I wasn't sure I totally hated it either. There are the discrepancies in Chicago geography I have issues with, but really, that's the least of my problems. The theme song is uninspired (though, fortunately, very brief). Essentially, it's just a few notes with a man singing "For the first time in my life, I see love" - and I don't like the implied idea that the only reason these people have someone to love is because they found someone else who shares their physical characteristics. The stereotypes are there, and they wear them like badges. The supporting characters are way too over the top - Molly's sister is irritating and obnoxious, her mother is boring and flat (and a total waste of Swoosie Kurtz' acting talent, if you ask me), and Mike's beat partner seems like he's trying too hard to be funny, so he comes off as offensive. Actually, it seems like most of the characters and the dialogue are trying too hard to be funny. Even the non-weight related jokes are often off-color and profoundly awkward. I hate canned laughter, and this show seems to overuse it - if you need to tell us when we should be laughing, it's probably not funny to begin with. While watching the first two episodes, I wondered how long the show could theoretically last. Honestly, where could the show possibly go? If Mike and Molly lose weight, the show loses its premise - and the writers lose most of their jokes. I wondered if it would have been better as a movie, but that brought to mind "Shallow Hal." It was a movie that came out about ten years ago, written and directed by the Farrelly brothers (in retrospect, that should have been the first clue about the content). In the movie, a man named Hal (Jack Black) only dates thin, attractive women - until Tony Robbins uses a hypnotic technique that changes his perception. After the chance meeting, Jack Black's character sees people not as they are physically, but the way they look on the inside. He falls in love with a woman named Rosemary (played by Gwyneth Paltrow) who is kind, loving, genuine, and who has dedicated her life to helping others, and therefore she looks beautiful to him. His best friend, however, recognizes Rosemary as being morbidly obese. There's a message to be found here, and it's really a shame that the Farrelly brothers - as well as the writers of "Mike and Molly" - go for the quick, cheap laughs rather than really dealing with the issues at hand. Molly gives up working out after burning "12 calories" when her mother and sister start sharing a piece of cake. Mike's beat partner compares hugging him to hugging a futon. Hal and Rosemary share a giant milkshake, and she drinks it at an unbelievable speed. 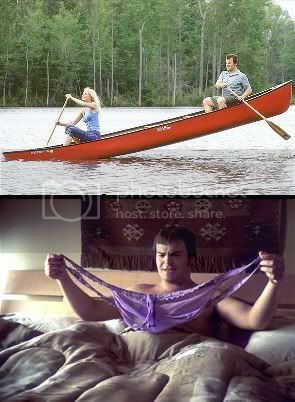 There are a lot more visual gags in the movie, such as seeing the petite Gwyneth Paltrow disrupt the balance in a canoe on a date, or the surprise on Jack Black's face when his character is about to become intimate with Rosemary - she is described as weighing 300 pounds, yet when she tosses him her underpants, and they're large to an extreme. Whatever good intentions there were in the message that the movie seemed to have wanted to convey are lost in a sea of wisecracks. I'm going to continue to watch "Mike and Molly," and I'm hoping for the best. I wish it were focused on two people who are starting to like each other who also happen to be overweight, and not emphasized the other way around, but who knows, maybe it will hit its stride in the next few episodes. I'm just kind of shocked that with two-thirds of Americans overweight or obese, it seems surprising that movies and shows like these still rely on the cheap gags. I haven't seen the show, but, I would be surprised if it lasted. The truth is, people are uncomfortable watching overweight people. It might not be the people themselves, but as you wrote, the gags and typical stereotyping that goes with it makes people cringe. We do have a problem in this country and I don't think people want to be reminded of that. I think that's why these garbage shows like Bachelor Pad and shows with the "beautiful" people do so well. The show would not be true if it didn't show the struggles of an overweight person's life, but trying to make them the joke... it won't work. I feel the same about the show. I can't exactly relate to Mike & Molly but I can see why these are stupid jokes are what's making the show. I am watching it because I like to see the budding relationship, and I want to see the show grow more into a real comedy without making fun. I trust that it might happen given it's still getting it's feet wet. I'm glad you liked the article - I knew as soon as you said anything mixed about Mike & Molly that that article was dead-on to everything that was wrong with the show! I haven't watched it yet, but I'll have to catch up online. I don't watch a lot of TV myself (just biggest loser - which has its own set of issues - and survivor) I'll keep what you said in mind.